Niamey – An awareness-raising caravan called In da na sa’ni (“If only I had known” in Hausa) left Niamey yesterday (04/04) for a monthlong trip to raise awareness of the risks of irregular migration and its alternatives. Geneva – Inter-State consultation mechanisms on migration are ongoing information-sharing and policy dialogues among States interested in promoting cooperation in the field of migration. Nouakchott – Nouadhibou is a key port in Northern Mauritania where over an estimated 32,000 migrants, refugees, and asylum-seekers are living. 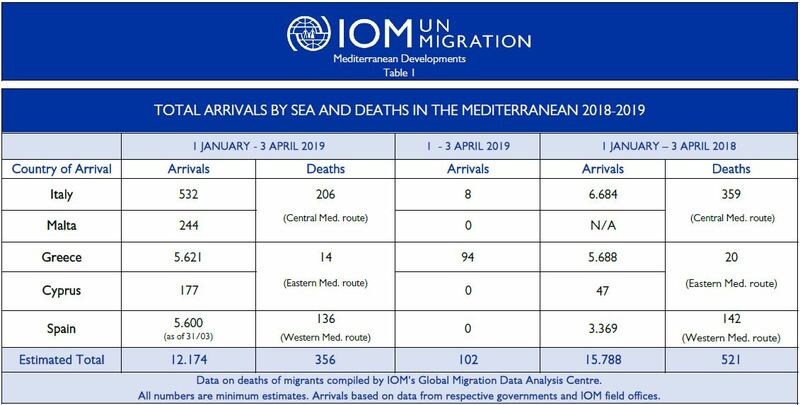 Geneva – The International Organization for Migration (IOM) reports that 12,174 migrants and refugees have entered Europe by sea through 3 April. Manicaland – The International Organization for Migration (IOM) brought a high-level delegation to the hardest hit areas of Zimbabwe following the after math of Cyclone Idai. Beira — A total of 37,720 Mozambicans have now received shelter aid in a concerted international response to devastation brought by Cyclone Idai.